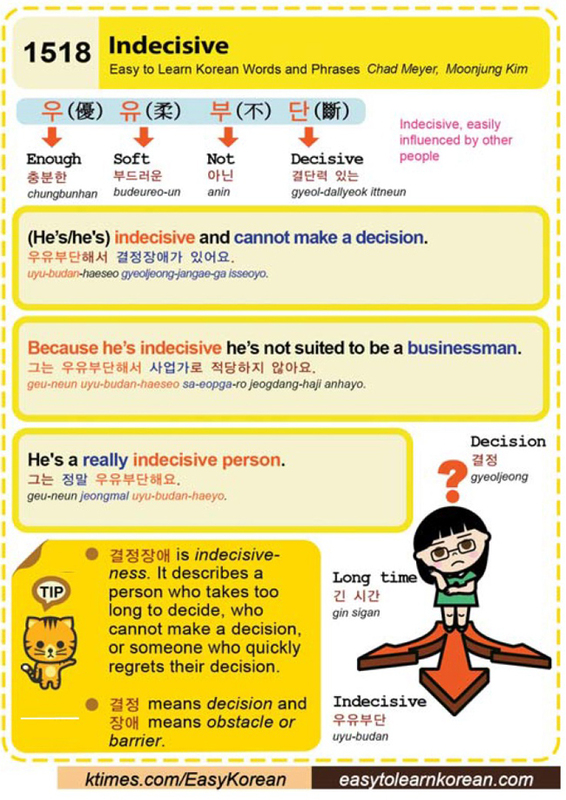 Easy to Learn Korean 1518 – Indecisive. This entry was posted in Series and tagged (He’s/he's) indecisive and cannot make a decision., barrier, Because he’s indecisive he’s not suited to be a businessman., decision, decisive, easily influenced by other people, enough, He's a really indecisive person., indecisive, indecisiveness, long time, not, obstacle, or someone who quickly regrets their decis, person who takes too long to decide, soft, who cannot make a decision, 不, 優, 斷, 柔, 결단력 있는, 결정, 결정장애, 그는 우유부단해서 사업가로 적당하지 않아요., 그는 정말 우유부단해요., 긴 시간, 단, 부, 부드러운, 아닌, 우, 우유부단, 우유부단해서 결정장애가 있어요., 유, 장애, 충분한 by easykorean. Bookmark the permalink.